Earlier today, President Donald Trump announced the federal government would reopen for three weeks while lawmakers continue negotiations over funding for a border wall continue. But before then, the partial government shutdown went on for 35 days. In the past, this sometimes meant national parks would close too. But this time around, they remained open — at least for the most part. 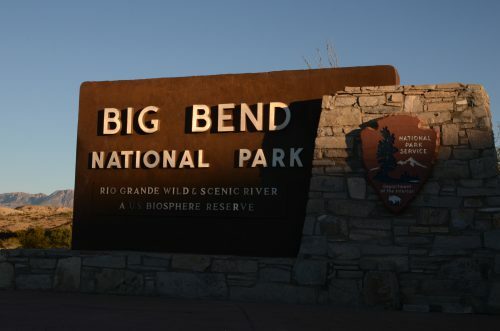 Out in far West Texas, thousands of visitors are still making their way to Big Bend National Park, even though only a quarter of the park’s staff were able to work. The effects of the shutdown were felt across the park and now south of the Rio Grande too. 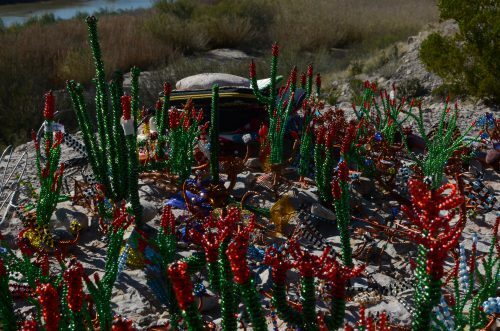 On the edge of the Rio Grande, near a remote Mexican town, 38-year-old Edgar Meza is watching over trinkets he’s left on the American side for Big Bend visitors to buy. Boquillas is a tiny and rural Mexican community, a stone’s throw from a curving overlook in the Big Bend. When the shutdown began in late December, the only legal border crossing — which takes you into Boquillas — was closed. 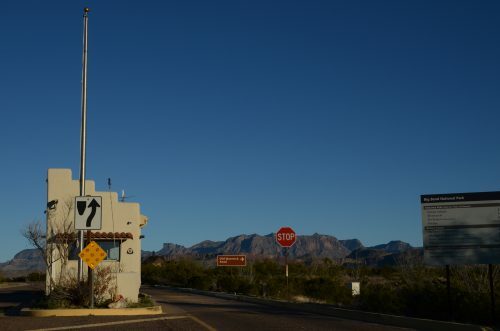 And no port of entry means no visitors for this tiny border town of 250. This isn’t the first time the Boquillas crossing has been closed. For more than a decade after September 11 the crossing was completely shut. And for Meza and other — though the crossing was reopened in 2013 — the partial government shutdown is a stark reminder of what can happen when the rural community is cut off from the park. On the U.S. side of the Rio Grande, there are still plenty of visitors to Big Bend, like Marsha Arvedson and her family. They’re one of many visitors this month, which is a busy time for Big Bend National Park. During this period last year, more than 35,000 visitors came through the 800,000-acre park. With few park staff working, the busy park traffic is giving Arvedson pause. During the first two weeks of the shutdown, about 20 park employees — out of 90 full-time and about 10 seasonal workers — were able to work, mainly in law enforcement and emergency service capacities. Park superintendent Bob Krumenaker said it was difficult to get the message to visitors that park regulations are still in place. 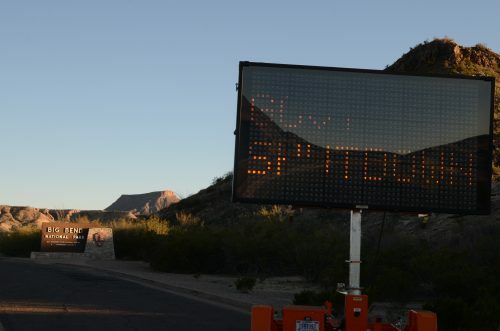 “We have at least one incident that we’re aware of that somebody drove around barricades and drove through the desert and did some impact on vegetation,” said Krumenaker. Krumenaker, who has been on the job for about 5 months now, said some campgrounds and trails have reopened to visitors. And earlier this month, the acting interior secretary directed parks to use funds from visitor fees —something normally used to pay for the growing backlog of deferred maintenance at national parks— to keep parks clean. This means some employees will begin receiving paychecks. Most park staff were hesitant to talk on the record, but for the most part, they’re still feeling the strain and just want to go back to work. The employees who are working during the shutdown still need to cover a park the size of the state of Rhode Island. What’s more, fire season’s also coming up. The area is already under moderate fire danger. The staff hasn’t been able to clear out dead vegetation or do other preventative work ahead of the driest time of the year. What’s making matters more pressing, all of this is happening with spring break just around the corner. Several Big Bend organizations and non-profits have started offering relief aid to furloughed federal employees. “The community has stepped forward both the park community itself, the employees helping each other and then businesses in the Big Bend area have been incredibly generous,” said Krumenaker. Below is a brief list of the area offerings for furloughed employees. If you have something to add. Let us know. Federal employees and their families are invited to attend a dinner hosted by Sul Ross State University. The dinner will be held in the cafeteria at the Morgan University Center Dining Hall located at the Sul Ross campus in Alpine. The Alpine Humane Society is offering free dog food and cat food for any furloughed federal employee that needs assistance. For more information visit their website. The Cottonwood Store in Terlingua is willing to hold grocery tabs until the shutdown is over. The Terlingua Trading Company will cash checks and hold them for deposit until the shutdown ends. Rio Grande Electric Cooperative will allow government employees to defer payment of up to two utility bills. For food assistance, furloughed employees can head to the Family Crisis Center of the Big Bend. They are located in the Terlingua Ghost Town. This entry was posted in KRTS News and tagged Big Bend National Park, boquillas, Government Shutdown. Bookmark the permalink.